Now this has all the makings of a reality show or a good made for TV movie. I would pay good money to go to their family reunion. 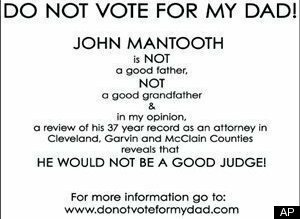 An Oklahoma judicial candidate is fending off a political attack from his daughter, who has taken out a local newspaper ad urging voters: "Do not vote for my dad!" Mantooth said the bad blood stems from his 1981 divorce from his daughter's mother. "This is a family issue which should have been kept private," he said Monday. "I'm very sad about this. I'm very disappointed. I'm hurt, but I love my daughter, and I want things to get better, and I hope they will." Jan Schill, 31, said she never has had a good relationship with her father and doesn't think he'd make a good judge. "We just felt like it would be bad if he were to become a judge," Schill said in a telephone interview from her home in Durango, Colo. "I assumed that he would not appreciate it, but he's made so many people mad, I'm just another mark on his board of people's he's had a beef with." Keith Gaddie, a professor of political science at the University of Oklahoma, said such campaigning illustrates that "none of us wants our lives too closely examined." "It's reality show politics," Gaddie said. "It's unsavory. It's undignified, and it's real." But Mantooth also suspects political maneuvering. He said his son-in-law, Andrew Schill, was once law partners with one of his opponents in Tuesday's primary, Greg Dixon.